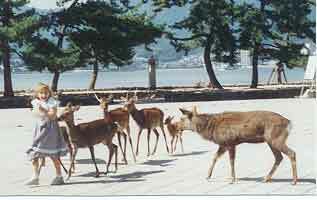 How would you like to visit a spot where deer roam freely through the streets, and three or four of them come up to you in every block, beg for food and permit you to pet them? Add to that scene a couple of kids who have brought left-over pancakes and bread to feed them and find themselves suddenly surrounded by a DOZEN deer. We did that on the little island of Miajima and we had one continuous, day-long laugh. 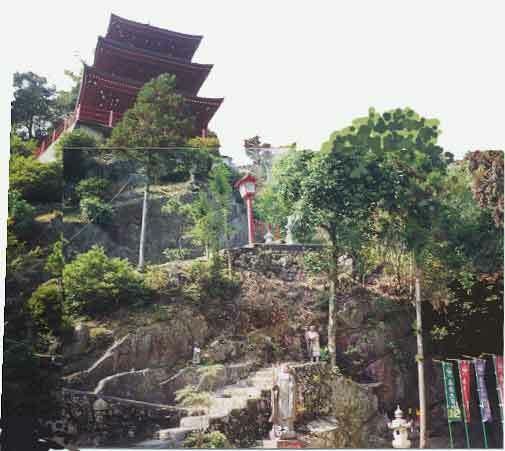 The island houses an extensive Shinto Temple (complex) with shrines and temples all over its mountain. But it is most famous for its magnificent "floating" torii (gate) which sits in water when the tide is in and which you can walk to when the tide is out. Because it is a sacred island, even though people live there year round, they are not permitted to die there, nor are women permitted to give birth there. Go figure. Having experienced a cultural exchange at a Japanese home, we have now experienced one where Japanese families came to us. 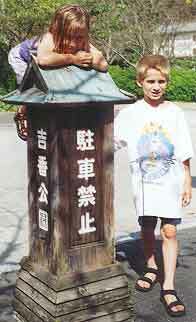 At the Japanese home, the children set the pace for playing fairly quiet and gentle. But here, Allie set the pace and we had a zoo. It was fun to watch. 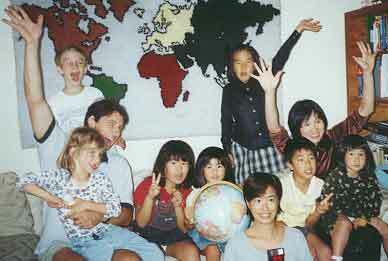 Five Japanese children came with two mothers (this night). Rich and Alisa have a ten-foot trampoline and the five little girls jumped on it most of the night. Nick and the boy disappeared upstairs and played games with Nick's collection of Pokemon cards. The oldest girl had just turned nine, so Rich had baked an angel food cake with strawberry icing. Three of the kids didn't even touch their piece of cake. Too sweet! One day when Alisa was at work and both children were in school, Rich drove Bob and me to Seven Falls Park, an hour and a half through the mountainous countryside. Mountains all the way. It sort of reminded me of West Virginia except the mountains are steeper and, therefore, closer together. Perhaps three to five of these mountains could fit into the area or space of ONE W.V. mountain. The W. V. mountains are well worn and rounded so people build houses on them. 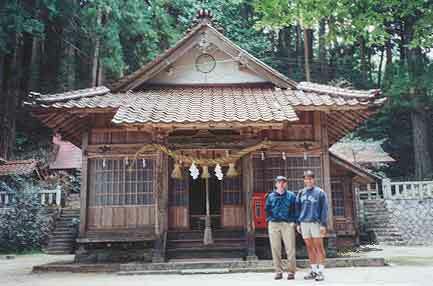 In contrast, the Japanese mountains are sharper, more crumbly, and it is rare that anyone puts a house on one. They have too many landslides here. I was told this is the case throughout Japan. Seven Falls Park is incredibly beautiful! A Shinto Shrine sits on the side of a hill in the midst of a grove of two-hundred-year-old temple trees. Back in Rockville, I planted a Japanese Temple tree off my kitchen patio thirty years ago. The aura of these trees is one of peace, quiet, calm and serenity. For those of you who have visited our home, if you thought OUR tree was lovely, just imagine a whole forest of really OLD ones. Last Friday night, we attended the 224th Navy Birthday Ball with Alisa and Rich. Since Bob doesn't like to dance and I don't like loud music, Alisa took us home after dinner and speeches as the band started to crank up. Because some have asked, the U.S. Marine Air Base is situated on an inland sea at the mouth of the Nishiki River which snakes through the little city of Iwakuni, up into the mountains on the southern most island of Honshu, thirty minutes south of Hiroshima. At the far end of the city, at the base of the mountains, the river is still wide and spanned by the famous Kintai Bridge, originally built in 1673. It's considered to be one of the most beautiful bridges in Japan, built of five wooden arches which sit on high stone abutments. These five arches are what make the bridge so beautiful and fun to cross. It's like going over five bridges. At the far end of the bridge and at the base of Mt. Shiroyama, is Kikko Park with its gardens, ponds, fountains, a shrine, a couple museums, restaurants, shops, etc. It must be a sight to behold in the spring with all the cherry blossoms in bloom. Truly, this is a nature-lover's delight. At the top of Mt. 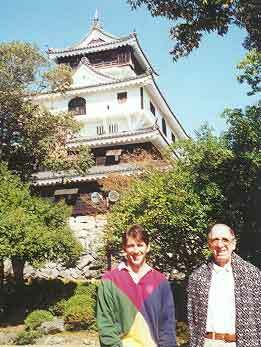 Shiroyama sits the Iwakuni Castle. Well, it's a castle by Japanese standards. We might call it a large seven -story house...an elegant house, for sure! To get to the castle, one takes a tram up the mountain, then walks up through a beautiful wooded nature preserve to the castle. After climbing up seven stories of the castle, you have a spectacular 360-degree view of mountain ranges on one side and on the other side, the city, river, air base and inland sea. Awesome! Already, we have been here twice and I hope we can do it one more time as there is still so much to see. In addition to the white snakes, a strange little phenomena exists in the area. Stone dolls! Now, they are only about half an inch high, but they look like tiny little people dressed in kimonos. They are a conglomerate of wee tiny black pebbles and sand, collected by an insect of a mole cricket family. Local artists collect them and do a very Japanese "thing" to them. They arrange the dolls in groups standing on an appropriate rock, glue them in place, encase them in a square glass box and sell them to tourists. Or, they take a small square piece of white cardboard, paint a picture on it (usually the Kintai Bridge), glue the dolls into the scene, place a clear plastic piece over the little frame for a smaller, more compact and cheaper example for tourists like me with limited funds and suitcase space. And, yes, of course, I'm bringing one home with me. I plan to carry it around with me until everyone has seen it. I am totally fascinated with them. I hope you will be too. Now that we are back home in Maryland, I would be remiss if I did not have one final wrap up on our memories of Japan. It came as no surprise that they drive on the left side of the road, that there are ornamental gardens in place of yards around their homes, and that the people are gentle, polite, gracious, dignified, fun-loving, and very civilized. Furthermore, it is common knowledge that, where in the U.S. they make up dumb blonde jokes, in Japan we receive a lot of attention, respect, and get our pictures taken when we aren't looking...a lot! Yes, even little old ladies like myself. 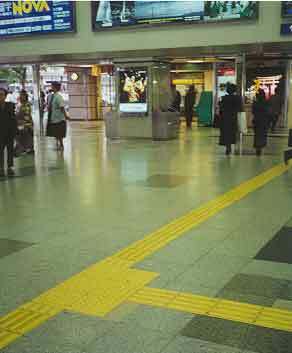 But there are other things that, at a glance, make Japan unique. They actually pave over the sides of some mountains that threaten to drop rocks on houses or roads and cars below. You find a yellow, twelve-inch Braille tile strip down the middle of most sidewalks, so the blind can feel their way with their canes (why don't WE have that?). Coreopsis grow all along the highways instead of dandelions. Children not only wear identical school uniforms, but they all wear their hair in identical short bobs creating the effect, at a glance, that entire classes have been cloned. And then there is their interesting approach to road and highway construction. You know the guy who stands in front of a road crew waving that flag to warn us motorists that there are live people working here? 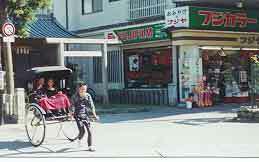 Well, in Japan, they have designed a life-sized, plastic mechanical flagman which, seen from a distance, looks just like a real flagman wearing the same clothes, etc., and he waves a cloth flag up and down. (And why don't WE do that?) But, get THIS: pretty purple backhoes and pink cement mixers. And why not? It certainly is fun to see them and brought a smile to MY face. Oh yes, Halloween was really a hoot! 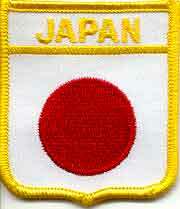 On the marine air base, an American family is only permitted to bring TEN Japanese guests on base at a time. This is because one year someone invited an entire Japanese neighborhood (I can't remember if Rich said 75 or 100 or 150), and they had Japanese running all over the place. This made security very nervous. So now, Rich and Alisa had to be very selective, who they invited. These kids (of their acquaintance), had never experienced the Halloween game. The little girls were all dressed up in princess costumes (one came as an American Indian princess) and the boys wore regular clothes and put on masks (ironically, Nick went as a full-costumed Ninja). On base, they were only permitted to go trick-or-treating between the hours of 6:00 and 8:00 pm. (One of the advantages of being military). I think they were pretty excited about it and really enjoyed themselves. I know WE did! One of the greatest aspects of our trip was that we went out to dinner about five meals a week. Only four meals were in restaurants on base; all the other meals were in Japanese restaurants. And those restaurants ranged from the Japanese equivalent of a deli and a McDonald's (where Nick and Allie could practice ordering in Japanese), to the finest, most elegant, the Sans Zoku. The Sans Zoku is a chain which constructs authentic looking Japanese "castles", complete with what appears to be (I'm sure it isn't) antique furnishings and art objects. The one where we dined was situated next to a mountain stream complete with beautiful gardens, bridges, lanterns ... and the "tourist trap" arts and crafts booths outside. Who cares! It was lovely! One night, we were taken to a very fine restaurant by one of Rich's students. We had our own private room upstairs. You know, the kind you see in the movies; small enough to be intimate but large enough for five kids to run around the table, if we had permitted, -- an enjoyable and very memorable evening, to be sure. Just before we returned home to Rockville, two more of Richard's students sent gifts to Bob and me. I cannot express how touched I was by these gestures. They had already been so kind to us, it really wasn't necessary. But Rich tells us that is the way of their hospitality. Just before we left, Rich took us to one of the most peaceful places I have ever been; a Buddhist Temple on the outskirts of Iwakuni. It's a place he sometimes goes to study or meditate or just sit and be. Of course there is the usual stream trickling through the area. It was very quiet - no people. We walked a little way up the mountain, past the usual statues and little shrines with vases of flowers amidst the ragged rocks and evergreens. It wasn't a very large area, but large enough to contain a couple temples. But when we arrived at the point where we stopped, we were high enough to view part of Iwakuni. But it was the peace that dominated. I think I shall never forget this one little spot in the world, and I shall return there again and again, in my mind, to experience the peace of that moment. Thank you, Richard!